Quan Ba twin mountain is plump, bewitching and looks like the plump breasts of a Fairy in a deep sleep. Quan Ba is a gateway district which is located in the southwest of the Dong Van Karst Plateau (Global geological park), Ha Giang province. Driving 46km to the north of Ha Giang city, passing Bac Sum steep towering in the clouds, tourists will come to Quan Ba heaven gate. Standing from here, visitors could see dreaming Tam Son town where is cool all year round, and could be compared with "Dalat" of Ha Giang. 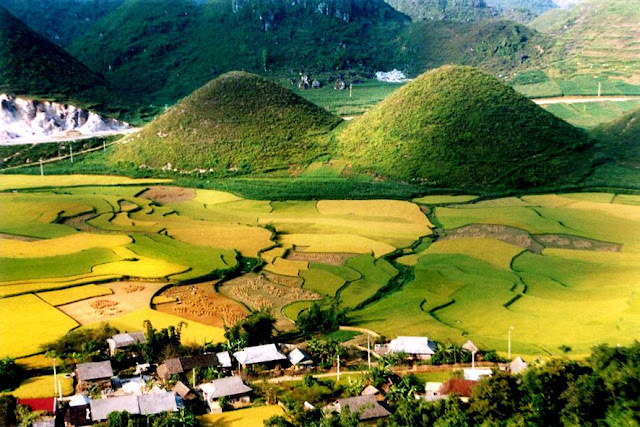 Especially, tourists can get an opportunity to see Quan Ba twin mountain which is plump, bewitching and looks like the plump breasts of a fairy in a deep sleep with their own eyes. Local people have called this unique pair of mountain “Twin mountain” for a very long time. In the bottom of the Twin Mountain is Quan Ba rice paddy. In different seasons of the year, the landsacpe and scenery has a diferent colour which is like the Fairy changing her clothes: the “green shirt” - that's when the rice fields are already in ear, when the fields are lush with ripening rice, the area is covered by a splendid “Royal robe”,…. ; however, the twin mountain is lively and lush all year round. Therefore, Quan Ba twin mountain is an attractive destiation of visitors everywhere. According to scientists, Quan Ba is made of Dolomite stone. Because of the weathering process, the rocks rolled equitably along the mountain sides, this gradually made mountain sides to slope and the peak became lower, and finally created such a conical shape as it is nowadays. Dolomite stone was weathered (due to the self rupture) into the pebbles and sand which very easily move downward along the mountain sides due to the effect of gravity and the runoffs during the rainy season. In particular, the alternate cracks which made the rock to be broken more esaily in diferent directions also played an important role in creating the pyramid of moutain peaks in genreral, and conical shape of Quan Ba twin mountain in particular. Quan Ba twin mountain belongs to the Quaternary, which date back to 1.6 to 2 million years. Tourists coming here are certainly to be astonished at the "masterpiece" that the Creator has endowed this land. Among the bulky rock mountains and the terraced fields, two moutains resurface with funny shapes, and therefore make all the visitors amazed. 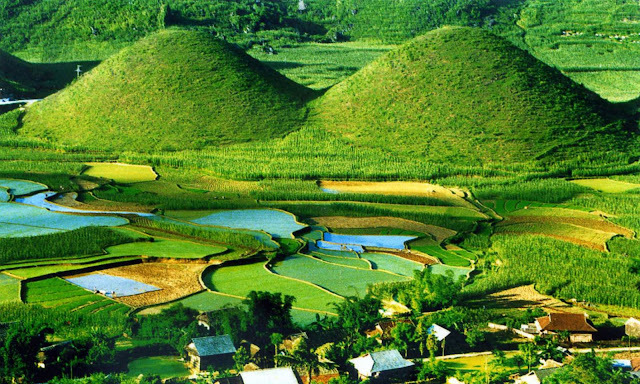 The twin mountain has been famous for giving the Quan Ba valley an attractive unique and imcomparable landscape, a wonder of the nature in the heart of the valley carrying many legends, and attracting numerous visitors. Having a convenient location, cool weather and fresh air of the highland, Quan Ba twin mountain has been becoming an attractive resort and destination in Ha Giang province. You can go to Ha Giang in general, and Quan Ba in particular at any time because in each season, this land has its own interesting things. 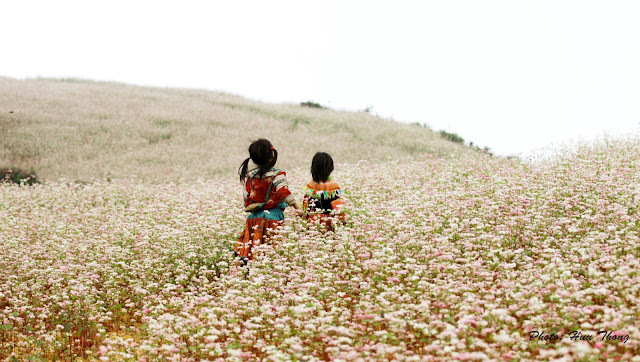 However, if you have imenity to admire the Buckwheat hill, you should come here from October to December anually. It is sure that you will have the extremely photos with the purple color of this kind of flower ! Please help me to buy bus ticket to Ha Giang from Hanoi !